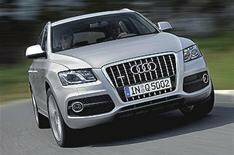 First drive: Audi Q5 | What Car? You might think this isnt the best time to be launching a 4x4 that costs the best part of (and in many guises well over) £30,000. Audi, of course, begs to differ. It suggests that new models like the Q5 will help it weather the financial storm simply by being so desirable that people will feel compelled to buy one. Is the Q5 worthy of such expectations? For the most part, yes. Lets just say that we dont think Audi will have any problems shifting units. Slick styling sets the tone for a car thats more about providing classy family transport than heading for the hills. For the record, Audi reckons that about 2% of prestige-4x4 drivers are likely to test the off-road capabilities of their car, but every Q5 comes with hill descent control and short overhangs, just in case. As far as on-road ability goes, the Q5 generally fares well. For a start, you get a choice of two brilliant diesel engines. Most buyers will go for the 168bhp 2.0 TDI that features in our group test and, due to its flexible, refined nature and low running costs, we reckon its the best bet. If youre after more poke, and have cash to burn, the 3.0 V6 TDI is worth a look. Its incredibly smooth and powerful and Audis seven-speed S tronic transmission comes as standard. The petrol alternative a 208bhp turbocharged 2.0-litre also has an S tronic box. Audis figures show that its quicker off the mark than the 2.0 diesel, but it doesnt have the same mid-range punch and, because you need to work it harder, its often noisier. Every version handles sharply, but the firm ride is exaggerated by the optional larger alloy wheels that were fitted to the cars we drove. Audi expects around 5% of buyers will go for the optional Drive Select system, which allows you to adjust the suspension and steering for a bias towards sport or comfort. The full package costs 1700 and, although the softest suspension setting helps the ride quality, we dont think the difference is enough to justify the outlay. Theres no doubt the Q5 is expensive, but you do get top-notch quality for the money. The exceptionally well-finished cabin is Audi at its best and theres also plenty of space for a family and their luggage. You can also be sure that, whatever state the economy has reached in a few years, therell be no shortage of buyers happy to shell out top dollar for a car as desirable as this.